"Just wanted to give a shout out to you guys at Best Boarding! Holly and Faolain stayed with you for 5 days and I can tell they had a blast! Holly has severe separation anxiety and when she returns from other boarders she usually acts out due to her anxieties but after staying at Best Boarding she has blended back into home life without any behavioural problems! This is such a relief to my husband and I and makes coming home a breeze for us. I can tell that Holly and Faolain felt right at home with you. Thanks so much! Now instead of dreading the next vacation we can look forward to it!" "Awesome staff!! Clean interiors, great attitude." "Staff was wonderful, Maggie looks great. We will be back." "We had our German Shepherd (named Mishu) stay at Best Boarding Kennels for over a year solid because our house burned downand we were rebuilding. Best Boarding took excellent care of Mishu throughout the entire year and today, Mishu went home in excellent condition. He looked great and had not lost any weight. 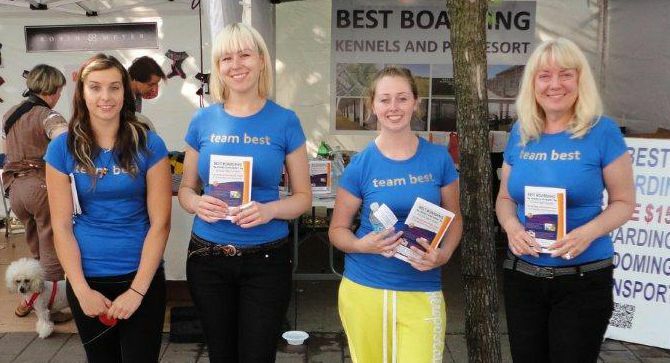 We would highly recommend Best Boarding Kennels to anyone for short or long-term stays." "Last week, we dropped our professionally trained working German Shepherd Dog off at Best Boarding Kennels for 7 days while we were away on vacation. Admittedly, I was a little nervous; working dogs can be...a bit of a handful and our dog in particular does not interact well with other dogs. The staff at Best Boarding Kennels were very professional and assured me that they would look after him. We returned to find our dog happy and health and learned that he been befriended by the staff there. Having a boarding kennel nearby with such professional and competent staff who devote so much time and energy to the dogs they board is very reassuring and lets my wife and I travel without having to worry about our dog's welfare. I will gladly use their services in the future!" "We trust our most precious possession to you and have for many years - your are all warm, caring and give us total confidence that our animals will be well looked after and loved - thank you"
"It's me Jasper! I'm the smartest of the group so I do all the writing. My brothers, sisters and I wanted to say thank you for looking after us while our mommy was off ignoring us. It was so nice to get attention from all of you." "Thank you for taking care of Eddie"
"You really know how to put a smile on our faces. Thanks for all the loving care over the last 10 years." "your kindness is greatly appreciated. Thank you for the great care and concern you showed Bonnie. I really appreciate it." "Thank you for the super care"
"Thanks for watching me! I had so much fun!" "Excellent service, thanks u guys rock!" "Louis V. loves it here at Best Boarding Kennels Inc"
"Excellent service as always, Zeus is very happy"